Nabarangpur-Online: BJD stage dharana against centre’s delay over tribal funds. BJD stage dharana against centre’s delay over tribal funds. 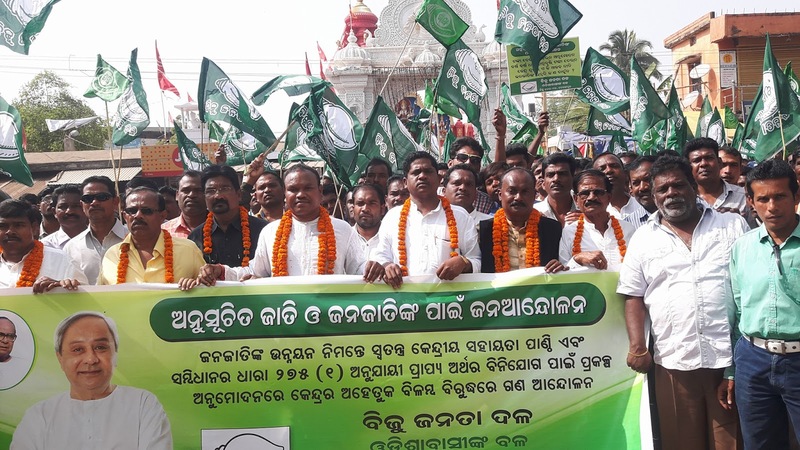 The district BJD led by district president Commerce and Transport minister Ramesh Chandra Majhi, staged demonstration in front of the Integrated Tribal Development Agency (ITDA) office over the central apathy in giving approval for utilizing funds under different programmes meant for tribal development. Speaking to the gathering Majhi said the tribal affairs ministry has provided funds as per Article 275 (1) of the constitution and special assistance to Odisha for the 2016-17, while the ministry is not approving the annual action plan which was submitted by the state government. Without the sanction to utilise the funds the state cannot be utilised. Due to the delay in giving sanction to utilise funds has affected the livelihood of thousands of tribal people including scholarship of tribal students Majhi said. Among others chairman of district planning committee, Monohar Randhari, Zilla Parisad President Motiram Nayak, district general secretary Ashis Ranjan Patnaik, member of State Transport authority Pramod Padhy with hundreds of party workers including chairman’s of blocks , zilla parisad members, samiti members, sarapanch's present in the demonstration. CM Naveen Patnaik to visit Nabarangpur on 24th.